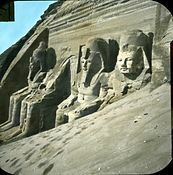 The Abu Simbel temples are two very large rock temples built by the ancient Egyptians, at Abu Simbel. This is a village in Nubia, southern Egypt, near the border with Sudan. The temples are on the western bank of Lake Nasser, about 230 km southwest of Aswan. They are part of the UNESCO World Heritage Site known as the "Nubian Monuments." 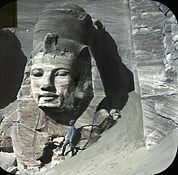 The temples were cut into solid rock in side of a cliff during the reign of Pharaoh Ramesses II in the 13th century BC. It was a lasting monument to himself and his queen Nefertari, to remember his victory at the Battle of Kadesh. The complete temples were moved in 1968, to a place high above the Aswan High Dam reservoir. They would have been flooded by water from Lake Nasser which was formed by the building of a dam on the Nile River. Work on the temples began about 1264 BC and lasted for about 20 years. It was called the "Temple of Ramesses, beloved by Amun". It was one of six rock temples built in Nubia by Ramesses II. The temple was meant to impress Egypt's southern neighbours. It also helped to strengthen Egyptian religion in the area. Historians say that the design of Abu Simbel shows Ramesses II's ego and pride. Over time people stopped using the temples which became covered with sand. In the 6th century BC, the sand covered the statues of the main temple up to their knees. The temple was forgotten until 1813, when Jean-Louis Burckhardt saw the top frieze of the main temple. He told Italian explorer Giovanni Belzoni, who went to the site, but was unable to dig out an entry to the temple. Belzoni went back in 1817, and was able to enter the temples. Details of the temples, with drawings, are in Edward William Lane's Description of Egypt (1825-1828). 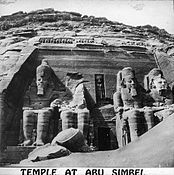 Tour guides at the temples tell a story that "Abu Simbel" was a young local boy who took Burckhardt and Belzoni to see the buried temple. He had seen the temples from time to time in the shifting sands. Eventually, the temples were named after him. The statue of Ramses the Great at the Great Temple of Abu Simbel. It is being put back together after being moved in 1967 to save it from being flooded. The collapsed colossus of the Great Temple may have fallen during an earthquake shortly after its construction. On moving the temple it was decided to leave it as the face is missing. In 1959 an international campaign was started to raise money to save the temples from being flooded by water from the new Aswan High Dam. One plan put forward was to build a dam around the temples to keep the water at the same level as the river. It was thought that raising the temples would put them in danger of being eroded by the wind. This plan was rejected. The moving of the temple began in 1964, with archaeologists, engineers and workers coming from all over the world as a UNESCO project. It cost $40 million at the time. Between 1964 and 1968, the entire site was carefully cut into large blocks. Some blocks weighed up to 30 tons, with most around 20 tons. These blocks were lifted and put back together on a new site 65 meters higher, and 200 meters further back from the river. This was one of the greatest challenges of archaeological engineering in history. 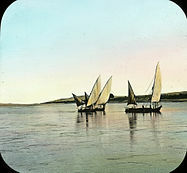 Some parts had to be saved from under the waters of Lake Nasser. Today hundreds of visitors come to the temples every day. Buses and cars leave twice a day from Aswan, the nearest city. Many visitors also come by plane, to an airfield that was specially built near the temples. There are two temples. The larger one was built for the gods Ra-Harakhty, Ptah and Amun. It has four large statues of Ramesses II on the facade. The smaller temple was built for the goddess Hathor, who is shown as Nefertari, Ramesses's favourite of his many wives. The temple is open to the public. The Great Temple at Abu Simbel took about 20 years to build. It was completed in the 24th year of the rule of Ramesses the Great (about 1265 BC). It was built for the gods Amun, Ra-Horakhty, and Ptah, as well as for Rameses himself, who was treated as a god. It is one the grandest and most beautiful temples from the time of Rameses II, and one of the most beautiful in Egypt. The facade of the temple has four 20 meter tall statues of the pharaoh with the double Atef crown of Upper and Lower Egypt. The facade is 35 meters wide. Across the top is a frieze with 22 baboons. The baboons have their hands raised to welcome the rising sun at dawn. These huge statues were carved into solid rock. All statues show Ramesses II, seated on a throne and wearing the double crown of Upper and Lower Egypt. The statue on the left of the entrance was damaged in an earthquake soon after it was built. The head and body are on the ground at the statue's feet. Next to the legs of the large statue, there are others no higher than the knees of the pharaoh. These show Nefertari, Ramesses's chief wife, and queen mother Mut-Tuy, his first two sons Amun-her-khepeshef, Ramesses, and his first six daughters Bintanath, Baketmut, Nefertari, Meritamen, Nebettawy and Isetnofret. Above the entrance is a bas-relief with two images of the king praising the falcon-headed Ra Harakhti. This god is holding the hieroglyph meaning user and a feather in his right hand, with Ma'at, the goddess of truth and justice, in his left. This is a really just a large puzzle with the answer being Ramesses II's throne name, User-Maat-Re. A stele on the facade records the marriage of Ramesses with a daughter of king Hattusili III, which sealed the peace between Egypt and the Hittites. Like most Egyptian temples it has a triangle shaped layout inside. The rooms become smaller in size from the entrance to the sanctuary. The temple has a complicated and unusual structure with many side chambers. The hypostyle hall (sometimes also called a pronaos) is 18 meters long and 16.7 meters wide. It is supported by eight huge Osirid pillars. These show Ramesses as a god, with Osiris, the god of the Underworld. This shows the unending nature of the pharaoh. The big statues along the left-hand wall have the white crown of Upper Egypt, while those on the opposite side are wearing the double crown of Upper and Lower Egypt (pschent). The bas-reliefs on the walls of the pronaos show battle scenes from Ramesses's many wars. 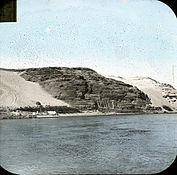 They show the Battle of Kadesh, on the Orontes river, in present-day Syria, where Ramesses fought against the Hittites. The most famous image shows the king on his chariot shooting arrows against his enemies, who are being taken prisoner. Other scenes show Egyptian victories in Libya and Nubia. From the hypostyle hall, one enters the second pillared hall. This has four pillars covered with beautiful scenes of offerings to the gods. Ramesses and Nefertari are seen with the sacred boats of Amun and Ra-Harakhti. This hall leads to another room which is the way in to the sanctuary. On a back wall are rock cut sculptures of four seated figures: Ra-Horakhty, Ramesses (as a god), and the gods Amun Ra and Ptah. Ra-Horakhty, Amun Ra and Ptah were the main gods during this time and their cult centers were at Heliopolis, Thebes and Memphis respectively. It is believed that the temple was positioned so that on October 22 and February 22, light from the sun would reach the sanctuary. This would light up the sculptures on the back wall, except for the statue of Ptah, the god linked with the Underworld, who always remained in the dark. These dates could be the king's birthday and coronation day. However, there is no evidence to support this. It makea sense that these dates had some relation to a great event, such as the 30th anniversary of the pharaoh's rule. October 22 is 60 days before the solstice and February 20 is 60 days after the Solstice. The image of the king would get energy from the sun, and Ramesses the Great could take his place next to Amun Ra and Ra-Horakhty. People gather at Abu Simbel to see this remarkable sight, on October 21 and February 21. The dates have changed by one day because of the movement of the Tropic of Cancer in the last 3280 years. The Small Temple was built about 100 meters northeast of the Great Temple. It was built for the goddess Hathor and Ramesses II's favorite wife, Nefertari. The facade is cut into solid rock, with two groups of very large statues on either side of the large gateway. The statues, slightly more than ten meters high, are of the king and his queen. On the sides of the entrance are two statues of the king, one wearing the white crown of Upper Egypt and the other with double crown. On sides of these are statues of the queen and the king. This is the only example in Egyptian art where the statues of the king and queen are equal size. Usually the statues of the queens stand next to those of the pharaoh, but were never taller than his knees. 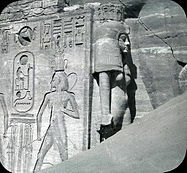 Ramesses went to Abu Simbel with his wife in the 24th year of his rule. There are small statues of princes and princesses next to their parents. 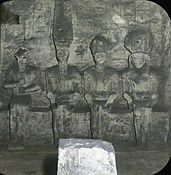 On the south side they are (facing them from left to right), princes Meryatum and Meryre, princesses Meritamen and Henuttawy, and princes Rahirwenemef and Amun-her-khepeshef. On the north side the same figures are in reverse order. The plan of the Small Temple is a simple copy of the Great Temple. The hypostyle hall or pronaos is supported by six pillars. They show scenes with the queen playing the sinistrum (an instrument sacred to the goddess Hathor), together with the gods Horus, Khnum, Khonsu, and Thoth, and the goddesses Hathor, Isis, Maat, Mut of Asher, Satis and Taweret. In one scene Ramesses is presenting flowers or burning incense. The capitals of the pillars have the face of the goddess Hathor; known as a Hathoric column. The bas-reliefs in the hall show Ramesses becoming a god. There are scenes of the king (with his wife) defeating his enemies. Another scene shows the queen making offerings to the goddess Hathor and Mut. Three large doors open into another room. 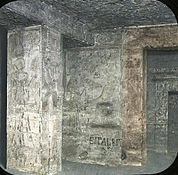 On the south and the north walls of this room there are scenes of the king and his wife giving papyrus plants to Hathor. Hathor is shown as a cow on a boat sailing through papyri plants. On the west wall, Ramesses II and Nefertari are shown making offerings to god Horus and the gods of the Cataracts — Satis, Anubis and Khnum. This room leads to the sanctuary and two side rooms. The sanctuary has bas-reliefs on the side walls with scenes of offerings to various gods made either by the pharaoh or the queen. On the back wall, there is a niche in which Hathor, as a divine cow, seems to be coming out of the mountain. Queen Nefertari is closely linked to this goddess. Each temple has its own priest to represent the king in daily religious ceremonies. The Pharaoh should be the only celebrant in daily religious ceremonies performed in different temples throughout Egypt. In reality, the high priest also played that role. A priest, like the king, needed education in art and science. Reading, writing, engineering, arithmetic, geometry, astronomy, space measurement, time calculations, were all part of this learning. The priests of Heliopolis, for example, became guardians of sacred knowledge and were seen as wise men. The hypostyle hall of the Great Temple, with eight Osiris pillars. The temple is the field headquarters of MI6 in the 1977 James Bond movie The Spy Who Loved Me. It has M's office, a conference room, and Q's laboratory. The main temple was used in Shusei Nagaoka's cover illustration for Earth, Wind & Fire's 1977 album All 'N All. The temple is shown in 2001's The Mummy Returns, as a way to the Oasis of Ahm-Shere. Team America mistakenly blows up the temple when they miss fleeing terrorists in Team America: World Police (2004). The temple can be seen in the background of the city-planet of Coruscant when Queen Amidala's ship first arrives in Star Wars Episode One: The Phantom Menace. 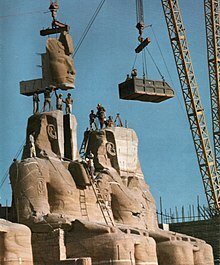 In Anne Michaels' second novel The Winter Vault the relocation of Abu Simbel is one of the main themes. The temple is a playable tomb in The Sims 3: World Adventures. In the video game TimeSplitters, the entrance to the tomb in the first level – "1935 Tomb" – looks like Abu Simbel. The 1985 computer game Abu Simbel Profanation written by Dinamic Software and released by Gremlin Graphics in the UK, has gameplay based around the temples and Egyptian setting. In the book by Matthew Reilly - The Six Sacred Stones, the lead character - Captain Jack West Jr., leads an expedition to the temple to find the First Vertex, and to place a "Piller" in said Vertex. Abu Simbel is one of the Wonders in the Wonder Pack expansion for the board game 7 Wonders. It is one of the locations in the 1954 movie Valley of the Kings. 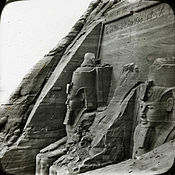 Abu Simbel is a site of one of the riddles in the 2006 novel Lost and Found by Carolyn Parkhurst. This page was last changed on 21 March 2019, at 20:44.